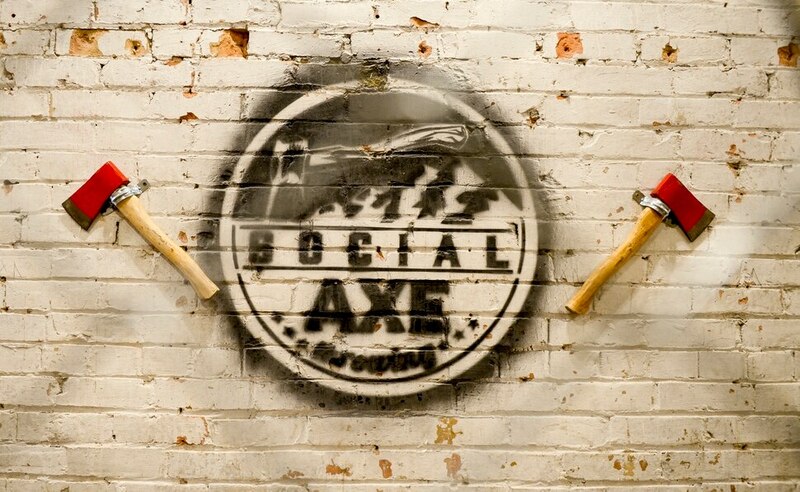 Ax-throwing plus beer? 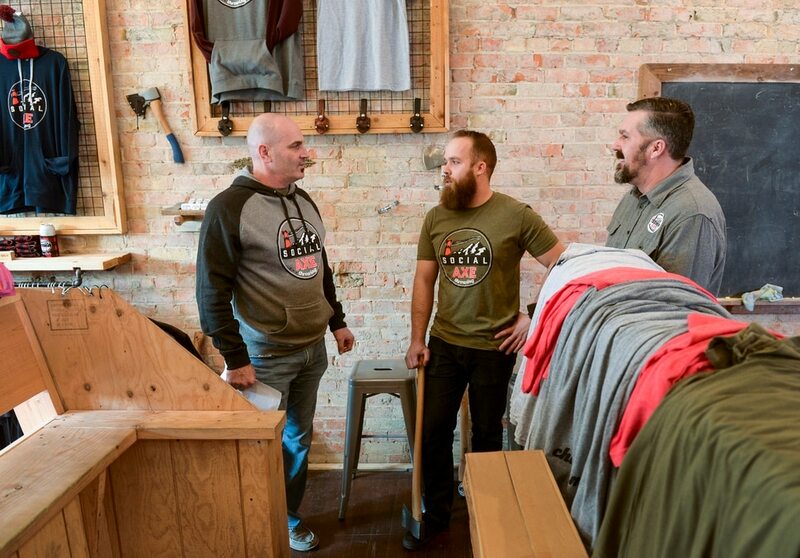 A new Salt Lake City business says it’s the perfect combo. It’s not every day you get a chance to scoop your freshly amputated toes off the ground and hobble into an ER, a long trail of blood dripping behind you. That might be your nightmare vision when you learn about Social Axe Throwing, Salt Lake City’s contribution to a rapidly growing trend in indoor group recreation. But its founders — who already have a location in Ogden — swear that no one has lost any blood. Otherwise, it’s just like it sounds — a bunch of people get together in a room and toss sharp axes at wooden targets for the sheer thrill of it. Kind of like bowling, only with potentially deadly airborne objects. (Leah Hogsten | The Salt Lake Tribune) Social Axe Throwing owners and partners Steve Lister, left, Brayden Floyd and Mark ... (Leah Hogsten | The Salt Lake Tribune) At the new Salt Lake Social Axe Throwing, housed in a 4,000-square-foot converted ... (Leah Hogsten | The Salt Lake Tribune) Social Axe Throwing co-owner Mark Floyd boxes the business's merchandise to take t... (Leah Hogsten | The Salt Lake Tribune) At the new Salt Lake Social Axe Throwing, housed in a 4,000-square-foot converted ... (Leah Hogsten | The Salt Lake Tribune) At the new Salt Lake Social Axe Throwing, housed in a 4,000-square-foot converted ... (Leah Hogsten | The Salt Lake Tribune) Social Axe Throwing owners and partners Mark Floyd, left, Brayden Floyd and Steve L... (Leah Hogsten | The Salt Lake Tribune) At the new Salt Lake Social Axe Throwing, housed in a 4,000-square-foot converted ... (Leah Hogsten | The Salt Lake Tribune) Social Axe Throwing co-owner Mark Floyd. (Leah Hogsten | The Salt Lake Tribune) Social Axe Throwing owners and partners Steve Lister, left, Brayden Floyd and Mark Floyd. Ogden's Social Axe Throwing has been in operation since April 2017 and the trio hope to open their Salt Lake City establishment in February. Ax throwing originated in Canada around 2011 and has now spread across the United States. (Leah Hogsten | The Salt Lake Tribune) At the new Salt Lake Social Axe Throwing, housed in a 4,000-square-foot converted steel fabrication shop at 1154 S. 300 West, you'll pay $15 per person for one hour, and $30 per person for two hours in a group of six or more. Ogden's Social Axe Throwing has been in operation since April 2017. 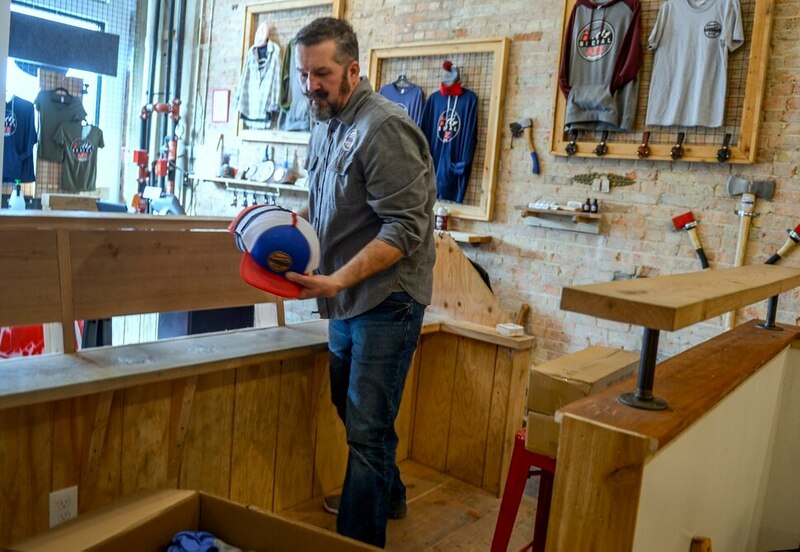 (Leah Hogsten | The Salt Lake Tribune) Social Axe Throwing co-owner Mark Floyd boxes the business's merchandise to take to the Salt Lake location. (Leah Hogsten | The Salt Lake Tribune) At the new Salt Lake Social Axe Throwing, housed in a 4,000-square-foot converted steel fabrication shop at 1154 S. 300 West, you'll pay $15 per person for one hour, and $30 per person for two hours in a group of six or more. (Leah Hogsten | The Salt Lake Tribune) At the new Salt Lake Social Axe Throwing, housed in a 4,000-square-foot converted steel fabrication shop at 1154 S. 300 West, you'll pay $15 per person for one hour, and $30 per person for two hours in a group of six or more. (Leah Hogsten | The Salt Lake Tribune) Social Axe Throwing owners and partners Mark Floyd, left, Brayden Floyd and Steve Lister. (Leah Hogsten | The Salt Lake Tribune) At the new Salt Lake Social Axe Throwing, housed in a 4,000-square-foot converted steel fabrication shop at 1154 S. 300 West, you'll pay $15 per person for one hour, and $30 per person for two hours in a group of six or more. (Leah Hogsten | The Salt Lake Tribune) Social Axe Throwing co-owner Mark Floyd. Social Axe Throwing co-owner Brayden Floyd says his Ogden enterprise has been wildly successful. Because Ogden just has more people you don’t want to mess with? Floyd got the idea from a YouTube video he saw two years ago that featured “Game of Thrones” actor Jason Momoa. Floyd went online and discovered that indoor ax-throwing is a thing, a fast-spreading sports/entertainment concept that began in Canada in 2011, catering to people who want a unique place to hold birthday and bachelor/bachelorette parties, corporate team-building outings, and date nights more interesting than dinner-and-a-movie. They’ll also host divorce/breakup parties, which requires the question: Could someone whose marriage ended ugly pin a photo of their ex in the bull’s-eye for some added target-hitting inspiration? Or a photo of your horrible boss? “If that ends up on your Facebook page, you may not have a job the next day,” said Brayden Floyd. Floyd estimates his Ogden location was one of the first 15 to open in America. Ax-throwing establishments are now in most major cities, and more open each month, with names like Stumpy’s Hatchet House, Bad Axe Throwing, Bury the Hatchet and Riot Axe. There’s even a National Axe Throwing Federation in Canada that sponsors tournaments and championships. At the new Salt Lake Social Axe Throwing — a 4,000-square-foot converted steel fabrication shop at 1154 S. 300 West — you’ll pay $15 per person for one hour. Groups of six or more pay $30 per person for a two-hour block. They’ll be serving beer? To stressed-out ax-chuckers? Yes — assuming they get their license approved. “It’s the question everybody asks when they come in,” said co-owner Steve Lister. The plan is to apply for a beer license and serve food in the Salt Lake location. In Ogden, they serve food and soda, and would’ve applied for a beer license if they had paid more attention to how close the address was to the Mormon temple. Brayden Floyd said that no one should be concerned about injuries, beer-enhanced or otherwise. “We’ll have very strict rules, like a two-beer-per-person limit, and it’ll be up to our coaches and staff to make sure no one goes over that and everyone is safe and has a good time,” he says. All hardwood hurlers have to go through a few basic safety lessons before they start throwing. After that, they learn technique — don’t throw the ax like a football or baseball; instead, hold it by the base of the handle, aim the blade at the target, raise it back behind your head and bring it around in a circle. Make sure to follow through, so your arm ends behind your back. Once you have the rules down and your throwing form perfected, there’s nothing like the rush and bonding experience of chucking sharp steel blades into hard wooden targets. Just don’t drop an ax on your foot. Smartly, there’s a no-flip-flops, closed-toed-shoes-only policy.